Numerous reviewers are impressed with how comfortable these trainers are in the gym. Various users praised its lightweight outsole design. Majority of wearers of the Puma Fierce Strap Swan liked the secure fit brought about by the stretchable strap closure. Quite a lot of women adored the highly fashionable cuts, detailing, and material. Some liked the all-white and all-black color versions as they blend well with a variety of outfits. Another reviewer appreciated the stylish placements of the Puma cat logo on the shoes. A good number of Puma Fierce Strap Swan wearers valued how airy and breathable are the fitness trainers. A consumer loved the reflectorized iridescent details as the looks stunning at night. A couple of users recommended wearing these trainers for performance and gym training. A few reviewers prefer wearing the Fierce Strap Swan for dance and aerobic fitness classes. A good number of commenters love the heel thickness and the rubber pods at the bottom as it doesn’t easily wear out. One reviewer suggested ordering these trainers a half-size smaller as they can run large after heavy use. Another user would have wanted more color options to choose aside from the all-black and all-white available colors. Some wearers noted that it is important to get the right size as the loose Puma Fierce Strap Swan shoes easily slip-off the feet. The Puma Fierce Strap Swan is one pretty and highly-fashionable women’s trainer that promises feminine touches without overwhelming the feet with unwanted embellishments. Designed to address the rigorous needs of women for workouts, the unique demi-cut silhouette of the bootie features a breathable mesh upper with eye-catching design and premium iridescent details. A flatlock stitching and a lace-up closure secure feet without the need for laces and sock. Meanwhile, a cushioned insole ensures extra comfort during fitness and dance routines and workouts. German brand Puma is no new player in the footwear industry. In fact, it can trace its roots from the Gebrüder Dassler Schuhfabrik (Dassler Brothers Shoe Factory) founded in 1924 in the small town of Herzogenaurach where another leading shoe company originated. Puma’s popularity was first boosted by football boots. The Puma brand, after establishing its credibility as a football shoemaker, needed a logo to further its aims of being recognized. Rudolf Dassler, Puma’s founder, introduced a sans-serif Puma typeface with a picture logo in 1957. The following year the second brand logo now included a formstrip which initially was intended to stabilize the foot inside the shoe and later on would be the typical trademark one would see in Puma shoes. Some 10 years later, in 1967, Nuremberg cartoonist Lutz Backes would, later on, create the logo of the jumping cat that is now among the most recognized brands in the world. Fast forward several decades later, Puma established itself as among the most recognized brands in the world creating sports shoes for the world’s top athletes. However, the brand also shifted into more fashionable shoes as it crosses over as a lifestyle shoe manufacturer. It was, however, most noticeable when in 2015 singer Rihanna entered the picture and became the brand’s global ambassador for Women’s Training and later on a creative director for Puma Women’s. Rihanna’s influence on Puma Women’s design with her FENTY line has been evident in the improved sales of the brand. Not stopping from its latest success in introducing fashionable shoes, Puma launched another campaign this time, with rising star Kylie Jenner in February 2016 as an endorser. This Rihanna and Kylie Jenner collaboration made the brand reach out more to the female market which for some time has not really taken off in the sneaker industry. But what really made the brand decide to team up with Jenner? It’s her massive following. Puma is reaching out to the millennial market and there’s no perfect fit to reach them than through reality star, Kylie Jenner. With her more than 60 million Instagram followers, Jenner has loyal fans that would buy anything she endorses including the Puma Fierce. Even though the young reality star did not have a hand in the design of the trainer shoe unlike Rihanna, her unique fashion style and following will have to do it for the brand. The Puma “Kylie Jenner” Fierce trainers feature an upper mesh with Ariaprene bootie for breathability and comfort for the gym going generation. It also boasts of an IMEVA midsole that makes a very lightweight shoe. What really makes the shoe stand out to its audience is its ability to be used while in the gym but still, goes fashionably trendy to wear in the mall or on the streets. 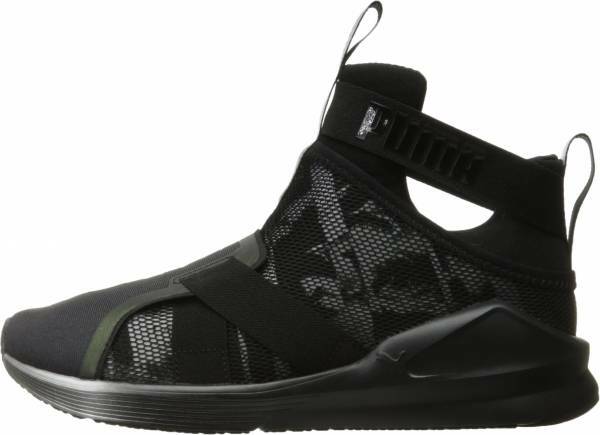 After the success of the Puma Fierce, the brand continued Jenner’s line with other versions of the Fierce including the Puma Fierce Strap Swan, Fierce Core, Fierce Nubuck Naturals, Fierce Strap Hypernature, Fierce Evoknit Metallic, Fierce Rope Cooper, Fierce Velvet Rope, Fierce Culture Surf among many others. When an influential millennial starts to flash a pair of Puma Fierce Strap Swan on various Social Networking sites, it is only just a matter of time that thousands of millennial fans will follow suit in donning a sneaker worn by Kylie Jenner. The ad campaign released by Puma had Jenner in an aerial dance projecting an image of grace and feminine power while wearing the sophisticated-looking shoe. Soon a good number of women began snapping up pictures of them wearing Jenner or posting online video blogs unboxing the latest Fierce model. But Jenner’s endorsement and fondness for Puma Fierce is just an aspect of the shoe that has thousands of teenage girls and fashion forward women craving for these shoes. The lightweight design, perfect fitting, quality materials, and fashionable silhouette are reasons enough to make these women instant fans of the Puma brand. The Puma Fierce Strap Swan has a good snug fit even without regular lacing. The trainers are secured by a special wrap upper with strap closure for a supportive fit. Aside from the special upper material, the shoe has an elastic strap that provides lockdown fit. The shoes are available in women’s sizes ranging from US size 5.5 to 11 with a medium B width. For a popular women’s shoe, the Puma Fierce Strap Swan has a lot of features to complement its fashionable silhouette. The demi-cut and lightweight Fierce Strap training shoe combine performance technology with an eye-catching design. Among these features include a special mesh wrap upper, solid rubber outsole pods, a pivot point for 360-degree movement and lastly, and a full-length flex groove for a fast and dynamic movement. The sneakers have removable insoles to customize arch support. Puma Formstrip and Cat logo detailing on various locations of the shoe. Fierce Strap Swan pack offers a subtle feminine underlay graphics with premium iridescent detailing. Solid rubber outsole pods provide full traction while a Pivot point allows plenty of movement.